3.7" LCD screen displays the time, temperature, humidity, and weather. With colorful LED backlight. Projects the accurate time, and the projecting angle is 180 degree adjustable. Alarm clock supports snooze mode. Two time modes available: 12 hours & 24 hours Digital thermometer shows as centigrade or Fahrenheit. With Max/Min temperature and humidity records. Specification: Humidity range: 20%RH~99%RH Temperature range: 0~50? / 32~122? Calendar: 2001 - 2099. Powered by 2 * AAA batteries (batteries are not included in the package). Note: Continuous backlighting and projection can only be available provided power adapter is connected. 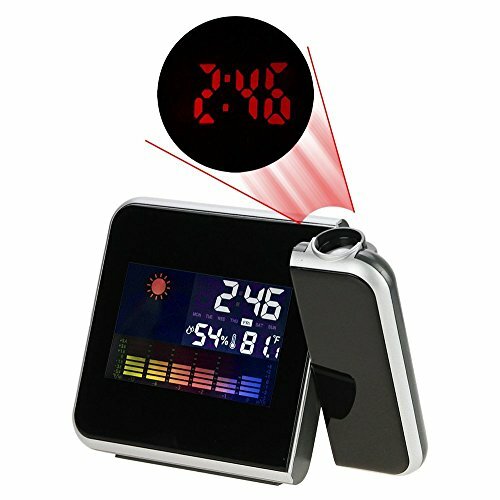 Package includes: 1 LED Projector Alarm Clock and 1 User Manual. If you have any questions about this product by Alarm Clocks, contact us by completing and submitting the form below. If you are looking for a specif part number, please include it with your message.